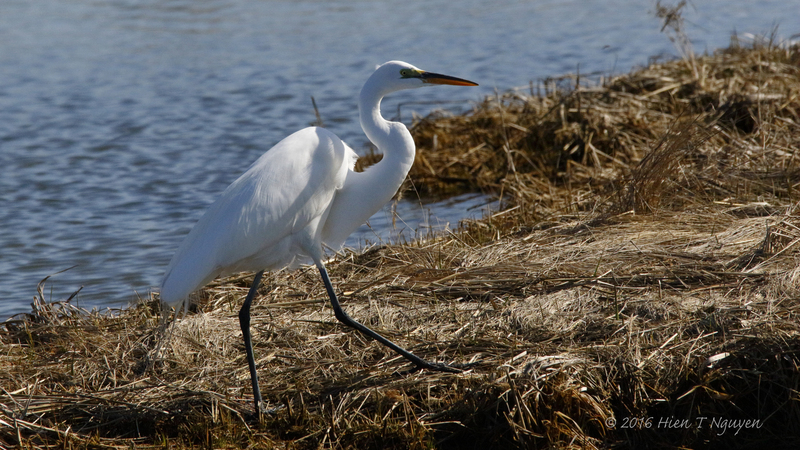 Around this time of the year, breeding season makes the Great Egret grow long feathers called aigrettes. 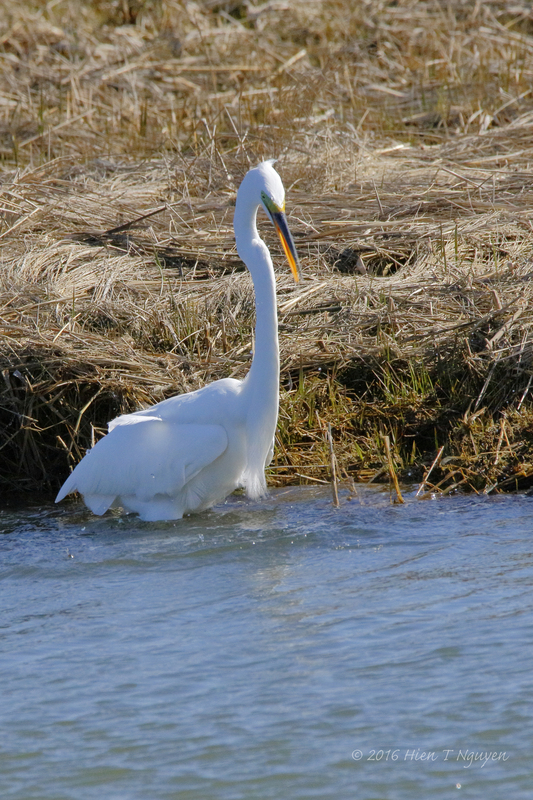 Those were much in demand by women more than a hundred years ago, leading to the extermination of 95% of the Great Egret population by the end of the 19th century. Today, they are no longer an endangered species and can often be seen in wetlands in North and South America. The one pictured below was standing by itself, occasionally straightening his neck to look for fish. Great Egret waiting for fish. Note the long plumes and the green around the eye, signs that it is prepared for the breeding season. Great Egret moving along shore as he saw fish swimming nearby. With his long yellow bill, he suddenly jabbed violently at the water several times. Great Egrets are regular visitors to the EBF refuge, staying there for many months, except for a couple of really cold months in the winter. They are one of the main reasons I go there. 🙂 Thanks Randall for visiting and commenting. Beautiful photos. What an amazing wing span. Thanks Katelon! 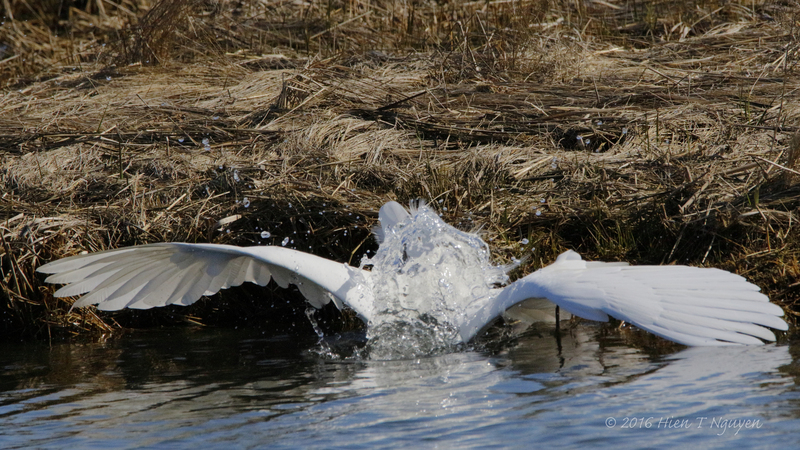 These egrets are very graceful in flight, and one of these days I will have a good photo of them doing that. Great capture. We love watching the egrets in our local reserve. Thank you! Their white color makes these egrets very eye-catching! Great photos of a species of bird that I don’t see as often as I’d like. Thank you Jerry. You have so many birds that I never see here. Very nice capture. The water for a head adds to the mystery of this Egret. Thanks! He looks small when his neck is tucked in, but when it is extended he can be very tall, the better to look for fish. Great action series! Exceptional beautiful shots of the Egret! A delightful gallery. I really like the pose and detail in the first image…pretty special! Thank you Nick. 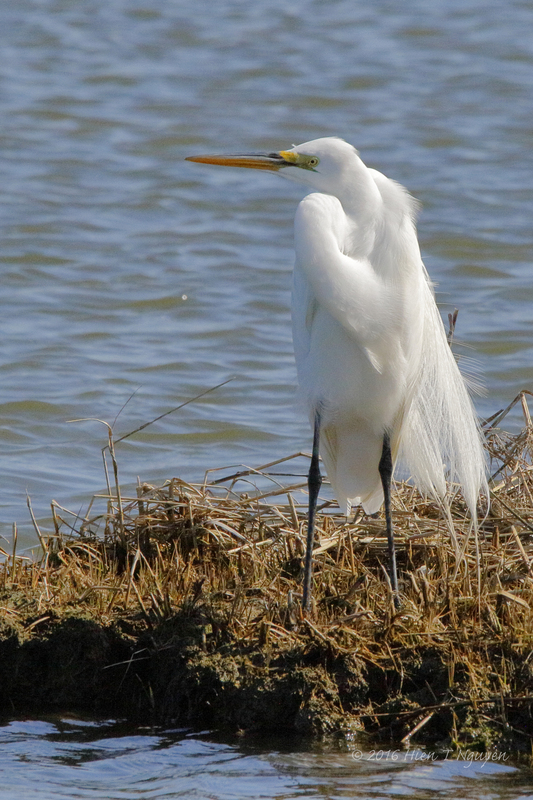 The refuge has many of these egrets and it is relatively easy to find one that would pose readily.